At the first annual Sweet Shoppe in Jack London Square, Oakland, May 8-9, 2010, a handful of local chocolatiers represented SFBA amid the other candy makers, confectioners and pastry chefs. East Bay stalwarts, Barlovento and Vice Chocolates, served up their usual quality chocolates. And we CBTB chocolateers had the chance to try wares from a couple of other locals, including a brand-new chocolatier. 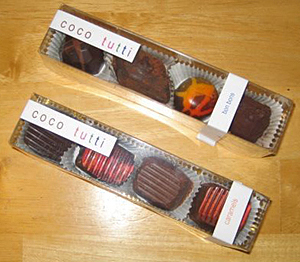 New chocolatier, Coco Tutti, makes bon bons & caramels that look like abstract art. We tried Coco Tutti’s chocolate caramels with orange confit and dark chocolate with orange marmalade bonbons, and we look forward to trying them again when they are more easily available. 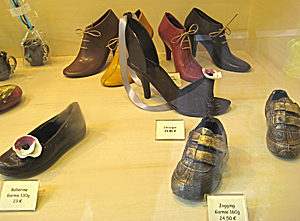 Because the chocolates are all hand-dipped, they had a substantial chocolate shell that balanced the strength of the orange flavoring the ganache and the caramel. They were very bright flavors, and the chocolates are pretty. They’d make good gifts or party favors. Not surprising given that Elyce’s other business is cake making. Another chocolatier at the show, Coco-Luxe Confections, known for their super-cute truffles, had an unusual offering: a pine nut and sage toffee called Sugar Pine Bark. We’ve shared this with friends, and it got mixed reviews. Some described a resinous flavor like Greek Retsina wine, while others couldn’t taste the pine nuts at all. I thought the sage gave it a soapy taste. The general consensus was that it might be an acquired taste; but for us, the chocolate part of the toffee wasn’t strong enough, and there was a split between the sage and pine nut flavors. But we give ’em props for pushing chocolate boundaries. 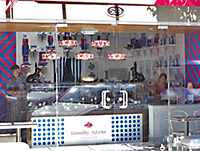 We hope there will be a second annual Sweet Shoppe in Oakland next year. They had vendors giving demonstrations, which is always potentially interesting, and it was a small enough event to give us a chance to chat with vendors and fellow attendees. Plus it’s down by the waterfront, which is an amazing place to hang out. With some quality chocolates from the event, it was perfect. A writer/designer, Nancy lives in Oakland with Ronnie, her husband of many years & fellow chocolate enthusiast. Date posted: July 23, 2010. 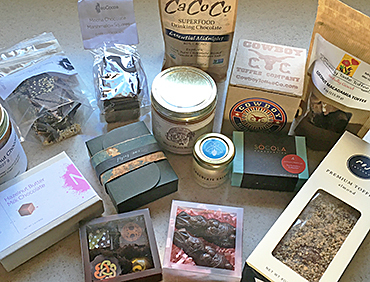 This entry was posted in East Bay chocolate, Local chocolate, San Francisco chocolate, Update and tagged artisan, barlovento, caramel, chocolatier, Coco Tutti, Coco-Luxe, East Bay, hand-dipped, handmade, marmalade, Oakland, orange, pine nut, sage, Sweet Shoppe, toffee, Vice Chocolates. Bookmark the permalink. Comments on this post are closed. Contact us via email below instead. Our mission is to feed and promote an appetite for chocolate and chocolate-related information in the San Francisco Bay area. © 2009-2019 Chocolate By The Bay. All rights reserved. Chocolate by the Bay is licensed under a Creative Commons Attribution 4.0 International License. Based on a work at chocolatebythebay.com.